If you saw me in person, you would immediately recognize I'm a petite gal (i.e. under 5'5"). Despite this known fact however, I'm not afraid to show off my height by wearing my flats and sneakers. In fact, I love them as much as my heels. Being in SF, I am often traipsing up/down a hill so I save my heels for the work place or when I know I'm not walking too much of a distance. I don't often wear heels that are beyond 4" but, these are...FABULOUS. They are too pretty to not pull out and wear. I reach average height with these babies and the view is pretty amazing up there. Hah. You are so, so pretty! And your outfit is super cute! such a fabulous outfit! 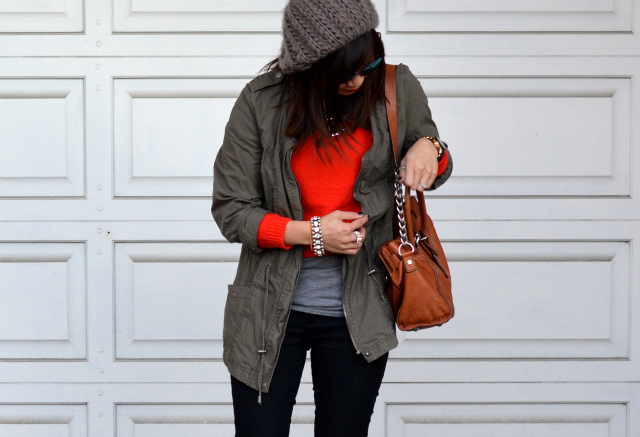 i love all the layering going on! what great shoes!! i love them! and i also love the rest of your outfit. 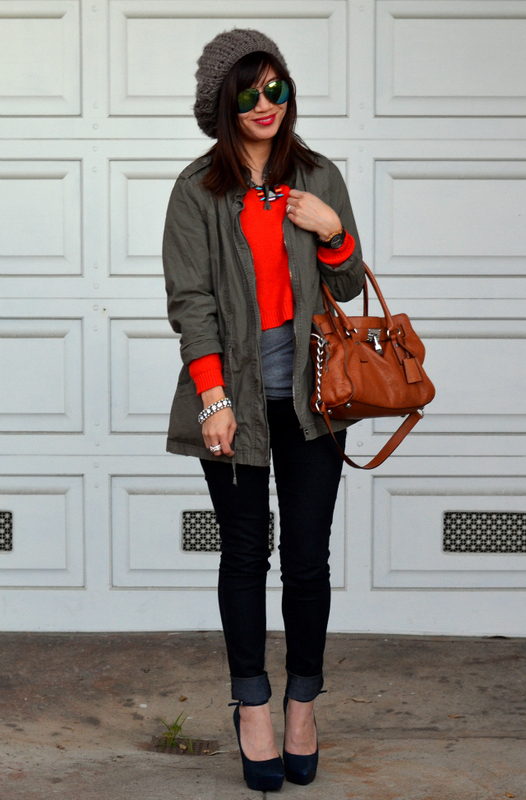 it's casual and chic and i love the pop of orange! I'm the same way. It's funny, though, because without heels, my husband and I are roughly the same height, but the higher the heel, the taller I am than him. LOL I love these layers here girl. 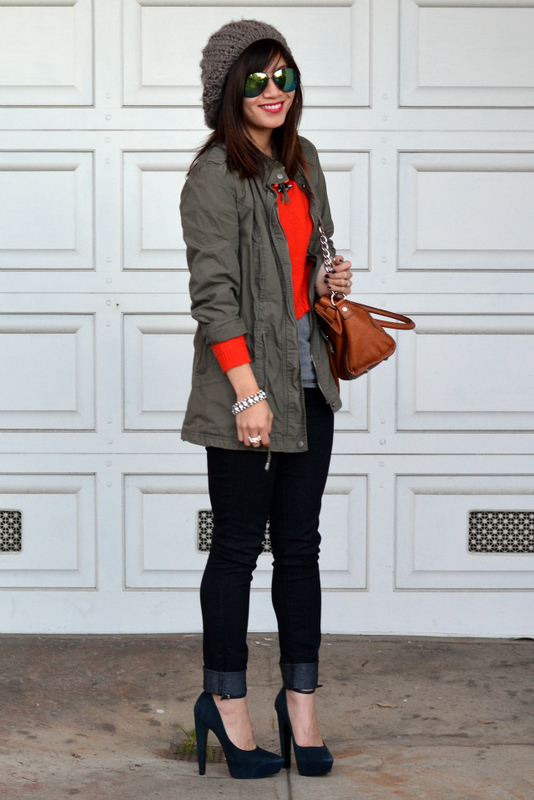 Perfect balance of neutral and bold color! I have to say, you pull off a hat flawlessly! I wish I looked that good in a beanie! Your entire look from head-to-toe is edgy casual and I love it. 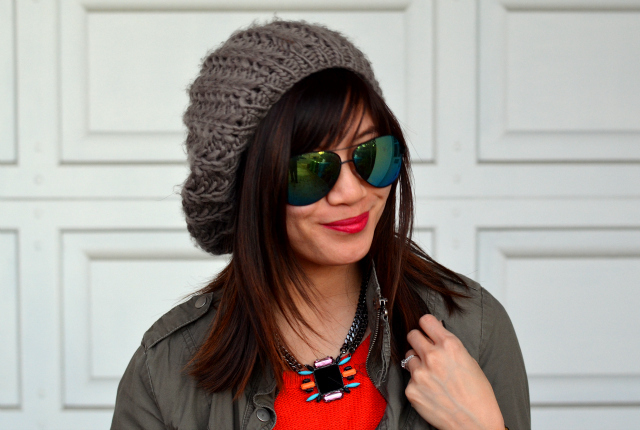 The pop of orange is great with the outfit and I love your shades, girl! Those shoes are amazing. You look gorgeous! Love those shoes! Your outfit is great,so chic! Those heels are beautiful! I love the color and the ankle strap look! Those heels are stunning! Does the platform help with the walking? I agree with high heels too! I would wear them all the time if it made sense, but running after 2 year old...not so much. I'm 5'3, so in the same boat as you my friend! 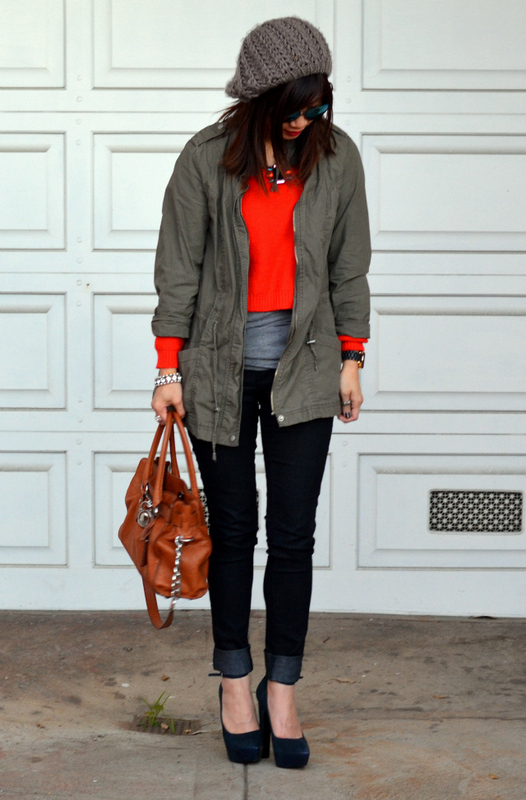 hi dear, love how you styled your parka, it looks incredibly sophisticated! Those are some shoes! And by some shoes I mean I must have them. I will only be able to walk for 30 seconds in them. Who cares...I can look good standing still right? You do! You look great! I love love love this look! Those heels are FANTASTIC. 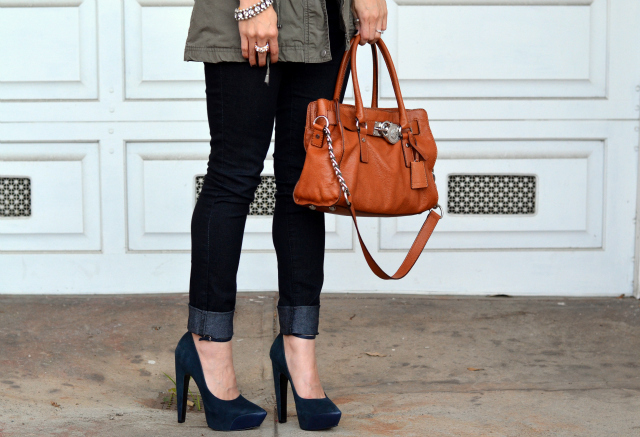 I love how the glam up a more casual, layered outfit. So chic! You always wear the best sunglasses! Great outfit! I am loving the red and teal green shoes!! I love so many things about this outfit!! Your shoes, hat, and necklace are gorgeous! love the skinnies and the shoes. you are so gorg! xO! WOW! those heels are extremely fab! love love love them! I also love that orange sweater! love those heels! i also wear tall heels and I'm 5'11"
Really great outfit! Love the bright orange sweater! And those shoes are so cool! those shoes are awesome! love your outfit and that necklace girl.